Born in June 1949 and raised in Oklahoma, Elizabeth Warren earned a B.S. from the University of Houston in 1970 and a J.D. from Rutgers Law School in 1976. She subsequently taught law at the University of Pennsylvania, the University of Texas, the University of Houston, the University of Michigan, and Rutgers. Then, in 1992 she began a two-decade stint as a professor at Harvard Law School. In 1984, Warren, claiming to be partially of Cherokee heritage, contributed five recipes to a cookbook titled Pow Wow Chow, which was edited by her cousin and was, according to its introduction, a compilation of “special recipes passed down through the Five Tribes families.” It was later learned, however, that Warren had plagiarized at least three of her five recipes. Two of those three originated at Le Pavilion, an exclusive French restaurant in Manhattan, and, according to Breitbart.com, “had appeared in an article written by Pierre Franey of the New York Times News Service that was published in the August 22, 1979 edition of the Virgin Islands Daily News.” Warren copied both of the recipes word-for-word. The third plagiarized recipe, “Herbed Tomatoes,” was apparently lifted from a 1959 piece in Better Homes and Gardens. For further details about Warren’s plagiarism, click here. In April 1986, when Warren was a professor at the University of Texas School of Law, she filled out a handwritten registration form with the Texas State Bar in which she identified her race as “American Indian.” This fact would not be reported by any media outlet until February 2019. 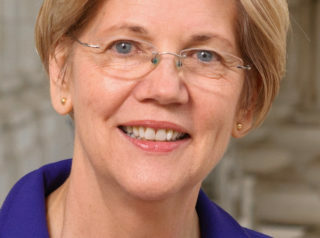 In addition to her professorial pursuits, Warren also has been a member of the FDIC’s Advisory Committee on Economic Inclusion, which focuses on “expanding access to banking services” and “promot[ing] asset accumulation” for “underserved populations.” Moreover, she has served as vice president of the American Law Institute and as the chief adviser to the National Bankruptcy Review Commission. In 2003 Warren and her daughter, Amelia Tyagi, co-wrote a book titled The Two-Income Trap: Why Middle-Class Mothers and Fathers Are Going Broke. The authors contend that because of the high fixed costs that modern-day Americans face, two-income families today are generally less financially stable than were single-income families in the 1970s. Warren and Tyagi portray a financial system where “the game is stacked against” ordinary Americans who seek “to provide a decent life for their children.” In the book’s Introduction, Warren praises leftist organizations like the Center for American Progress, Demos, the Drum Major Institute for Public Policy, and the New America Foundation for having helped raise people’s consciousness about “issues related to families’ economic stability.” She also notes, proudly, that her book has been quoted by such Democrat luminaries as Howard Dean, John Edwards, Richard Gephardt, Ted Kennedy, and John Kerry. On March 19, 2004, at Washington and Lee University in Lexington, Virginia, Warren spoke at a symposium entitled “Critical Race Theory: The Next Frontier,” alongside a number of academics who, according to FreeBeacon.com, “have advocated for corporate and government reparations for African-Americans, criticized the concept of U.S. citizenship, and accused the United States of operating under a system of ‘apartheid. '” Founded by the late Derrick Bell, critical race theory is an academic discipline which maintains that society is divided along racial lines into (white) oppressors and (black) victims, similar to the way Marxism frames the oppressor/victim dichotomy along class lines. Warren and her husband purchased a home for $50,000 in 1991, subsequently filed permits for mechanical and plumbing repairs, and eventually sold the house in 1998 for $109,500, a 119% gain. In August 1993 Warren bought a home for $30,000, quickly obtained permits to do plumbing and electrical work, and sold it five months later for $115,000, a 383% profit. Also in 1993 Warren purchased a foreclosed property in Oklahoma City for $4,000. Eleven years later she transferred the home to her brother and his wife, who eventually sold it for $30,000 in 2006; neither Warren nor her brother had ever filed any permits to make improvements on the dwelling. In June 1993 Warren bought another foreclosed property in Oklahoma City for $61,000 and, despite filing no building permits to renovate, sold it for $95,000 in December 1994. In 1994 Warren purchased yet another Oklahoma City house for $72,000 and, having filed no building permits to renovate, sold it for $104,000 in 1998. In 2007, Warren wrote a piece in the Harvard Law and Policy Review proposing the creation of a federally funded “Service Pays” program in which the government would “increase the amount students can borrow” for college loans, and would then “forgive students one year of college expenses for each year the student worked in public service after college.” This, Warren explained, would enable “typical students” to “begin adult life debt-free at twenty-six with a college diploma and four years of work experience.” Such an arrangement, she added, should also be extended to students who failed to graduate from college. Warren envisioned Service Pays as “a reformed Peace Corps that would place young people with aid and development organizations around the world,” to assist with such tasks as “rebuilding after natural disasters”; “teaching English”; “improving water usage”; teaching math and science in “urban and rural schools with a substantial minority or lower-income student body”; running “after-school tutoring programs”; “clean[ing] up public buildings and parks”; “rebuild[ing] roads and bridges;” “improv[ing] the environment”; and “organiz[ing] communities to reduce crime and develop the local economy.” Added Warren: “Non-profit organizations that want to participate in Service Pays could apply to the program and be considered on the same basis that AmeriCorps currently uses: ‘Direct service activities must address local environmental, educational, public safety,… or other human needs.” Critics of Warren’s proposal observed that it had the potential to be used as a means of assigning young adults to work with leftwing organizations that would indoctrinate them to a particular political viewpoint. Also in 2009, Warren co-authored an article asserting that some 62.1% of all U.S. bankruptcies were the result of medical expenses that people could not afford – supposedly a 49.6% rise over 2001 bankruptcies due to medical expenses. Emphasizing that few Americans were immune from the possibility of becoming insolvent, the authors noted that “most medical debtors were well educated, owned homes, and had middle-class occupations”; moreover, “three quarters had health insurance.” Megan McArdle, the business and economics editor for The Atlantic, subsequently pointed out that this study was statistically flawed, and that no rise in medical-related bankruptcies had in fact occurred. In September 2009, Warren worked as a consultant for Travelers Insurance in the Supreme Court case Travelers Indemnity Co. v. Bailey. In that case, Travelers won permanent immunity from all personal-injury lawsuits related to its bankrupt former client, the asbestos-manufacturing Johns Manville Corporation. Records show that Travelers had been aware of the dangers of asbestos for decades, but had misled the public about those dangers. In a Supreme Court brief, Warren criticized the “enterprising plaintiffs’ lawyers” who represented asbestos victims. She received more than $200,000 in legal fees for her services. Warren was named one of Time Magazine’s “100 Most Influential People in the World” in 2009 and 2010. Between 2007 and 2010, Warren’s idea of establishing a federal agency to protect financial-product consumers found considerable support in Congress and culminated in a Consumer Financial Protection Bureau (CFPB) being incorporated into a financial regulatory reform bill that was passed in summer 2010. In the summer of that year, Senator Tom Harkin circulated a petition advocating that Warren be named as director of the new CFPB. Warren was likewise endorsed for that position by Congressman Barney Frank, Democrat Senator Al Franken, the socialist Senator Bernie Sanders, SEIU president Andrew Stern, AFL-CIO president Richard Trumka, and the activist organization MoveOn. In October 2011, Warren — while enjoying a $429,000 Harvard salary and residing in a $5 million mansion — expressed support for the anti-capitalism rallies which were staged in cities across the United States by Occupy Wall Street and other activist groups. “I created much of the intellectual foundation for what they do,” she said in an interview with The Daily Beast. “I support what they do.” To view a list of additional noteworthy individuals and organizations that endorsed the movement, click here. On May 1, 2012, it was reported that Cherokee genealogist Twila Barnes had discovered that one of Warren’s great-great uncles had made a notation on his own marriage license indicating that his mother (Warren’s great-great-great-grandmother, O.C. Sarah Smith Crawford) was a Cherokee. If that notation (which was not part of the official license) was accurate, it would make Warren 1/32 Cherokee. But in mid-May 2012, it was learned that the document bearing the aforementioned notation was merely an application for a marriage license, not the license itself. Further, census records list O.C. Sarah Smith Crawford as “white,” and Warren’s family is not listed in the Cherokee registry. For a timeline of events regarding Warren’s claims of Native American heritage, click here. In October 2018, Warren shared with the Boston Globe the results of a DNA test conducted upon her by Stanford University researcher Carlos D. Bustamante. In a summary of his findings, Bustamante wrote: “The results strongly support the existence of an unadmixed Native American ancestor … in the range of 6-10 generations ago.” This means that Warren’s ancestry is somewhere between 1/64th and 1/1,024th Native American – i.e., between .09 percent and 1.6 percent Native American. The average European-American, meanwhile, has 0.18 percent Native American DNA. On September 5, 2012, Warren spoke at the Democratic National Convention in Charlotte, North Carolina. In November 2012 Warren was elected to represent Massachusetts in the U.S. Senate. “Undeterred by this undebatable solvency crisis, Sen. Warren wants to increase benefits to all seniors, including billionaires, and to pay for them by increasing taxes on working people and their employers. Her approach requires a $750 billion tax hike over the next 10 years that hits mostly Millennials and Gen Xers, plus another $750 billion tax on the businesses that employ them. “Warren, meanwhile, continues to skirt congressional ethics laws by failing to include a $1.3 million line of credit against her Cambridge, Massachusetts home on financial disclosure forms. The line of credit was extended to Warren and her husband Bruce Mann in 2007 through financial giant Bank of America. It was first noted by the Boston Herald after Warren failed to included the line of credit as a liability on her 2014 financial disclosure filing. It was also absent from her 2015 filing. “An aide for Warren, who is worth millions, defended the omission, stating at the time that a home equity line of credit like the one that Warren received from Bank of America doesn’t have the same reporting requirements as a typical home mortgage, which would have to be reported. In April 2018, Warren was one of 12 U.S. senators who sought to punish the Sinclair Broadcast Group – widely perceived as a conservative media company – which (a) consisted of 193 television stations and 614 channels in 89 markets nationwide, and (b) had recently announced plans to acquire the Tribune Media Company’s 42 TV stations in 33 markets, a merger that, if completed, would extend Sinclair’s reach to 72% of all American households. The twelve senators included Warren, Independent Bernie Sanders, and 10 other Democrats: Tammy Baldwin, Richard Blumenthal, Cory Booker, Maria Cantwell, Edward Markey, Jeff Merkley, Patty Murray, Tina Smith, Tom Udall, and Ron Wyden. During a question-and-answer session hosted by Congressional Black Caucus chairman Cedric Richmond at the historically black Dillard University in New Orleans, Warren delivered what she called “the hard truth about our criminal justice system: It’s racist … I mean front to back.” In the course of her remarks, the senator cited such things as disproportionate arrests of blacks for petty drug possession; an overburdened public defender system; and state laws that sometimes bar convicted felons from voting in political elections for the rest of their lives. On October 29, 2018, the Foundation for Accountability and Civic Trust (FACT), a non-partisan ethics watchdog group, filed a complaint with the Senate Select Committee on Ethics against Senator Warren and Senator Kamala Harris. Said the FACT complaint: “Senators Warren and Harris both sent campaign fundraising emails before the Senate vote on Supreme Court Justice Brett Kavanaugh. Specifically, the campaign emails both stated Senators Warren and Harris’s official role and positions on the ongoing confirmation hearing and then made direct requests for campaign donations with ‘DONATE NOW’ and ‘CONTRIBUTE’ buttons. Senate ethics laws prohibit candidates from using the promise of official action or legislative work in a direct ask for campaign cash.” “This is a clear violation of the Senate Ethics rules which safeguard against the appearance or actuality of elected officials ‘cashing in’ on their official position for political purposes,” said FACT executive director Kendra Arnold. On December 31, 2018, Warren announced that she planned to run for the office of U.S. President in 2020. For an overview of Warren’s voting record on an array of key issues, click here. For additional information on Elizabeth Warren, click here.